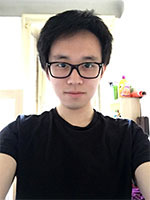 Xinzhi Li has received his M.Sc in Material science and nanotechnology from Politecnico di Milano in 2017 in Italy. He did his master thesis in the group of Prof. Luca Magagnin. During his master’s research, he focuses on the Graphene coated Ni-Cu alloy as high-performance capacitances electrodes. Currently, he is a Ph.D. student working on low-k materials preparation by ALD and MLD in the group of thin film and nanostructured materials in University of Helsinki.